In my ever growing quest to bookmark all the sweet design information pages on the internet, I have recently come across three web pages that caught my intrest. I wanted to post web pages in diffrent area’s of intrest to attempt to intrigue a larger range of designers. Hopefully these may help or inspire you. -What type of navigation should my new site have? If you ever find yourself asking this question perfhaps check out this link to show you both the advantages and disadvantage to tabbed navigation. -Web design, my favorite area of work as a graphic designer, I am often times finding myself looking up specific php tools and files. Here is a list, and download link, for 9 helpful tools and files you may could use to demonstrate web site possibilities or give you ideas of your own. -Who says print design is dead? 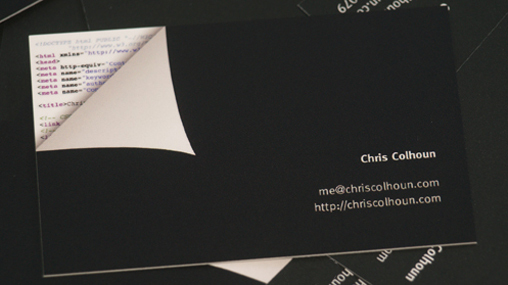 Here are not only 50 cool and creative buisness card ideas but also many ways to graphically think outside the box. to seal burger top to burger bottom level. Open StufZ and push disc up from the bottom, ejecting your stuffed burger. read. And on this article Sweet Design Info | Ninthlink. Is it simply me or do a few of these responses appear as if they are left by brain dead individuals?